When five greats play their weekly DFS game long enough, sooner or later something has to give. Last night was the seismic crack in our DFS earthly foundation and an executive decision had to be made. This is a historic day in this country, not because it is Independence Day when our founding fathers signed the constitution. Someday, it will be remembered as the day the founding fathers of the Gentleman’s game; DStars45 and Swindaman3, tied for second place. Both gladiators tied at 95.7 points, with completely different lineups. Both contestants were awarded with 3.5 points for the week for this effort. 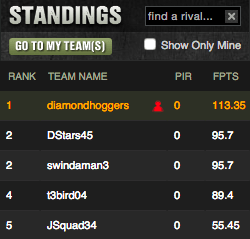 Diamondhoggers continues to wake from their slumber – following up a second place in last week’s contest with a first place this week. The tide turned for good when Adrian Gonzalez homered into the Los Angeles night off Noah Syndergaard. 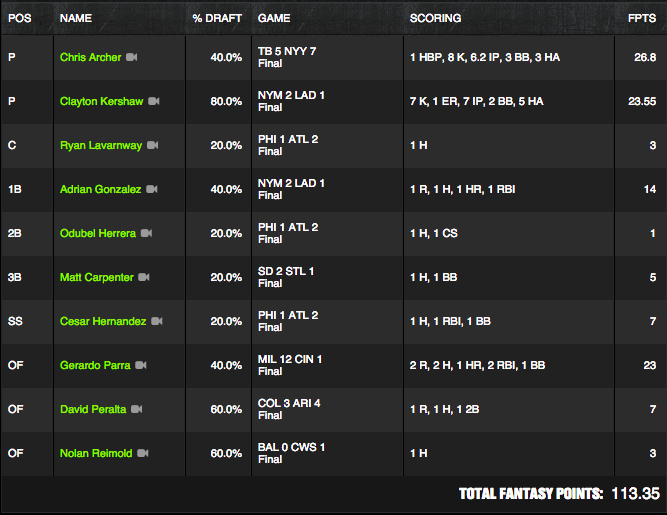 Things are tight in the yearly leaderboard in this epic clash of the titans of DFS baseball. DStars45 has reclaimed his spot at the top over our own t3bird04. So what will happen next week after this historic tilt? Will Diamondhoggers and JSquad34 continue to argue over who is in last place in the standings? Will we see another tie that forces the hand of the chairmen of the competition committee of the Gentleman’s game? Will anyone have the stones not to use an ace pitcher, trusting a true turd with their most sacred opportunity? Will Gerardo Parra continue to be priced in the 3700 range while playing like a 5800 outfielder? You must tune in next week to find out of course. This is the Gentleman’s Game and it is the finest competition the DFS community has ever seen. In fact, Draftkings has been in contact with the chairmen’s committee about making the winner of this great joust the next Draftkings Pro Ambassador. Even Draftkings knows how prominent the crown is for this pantheon of greats.